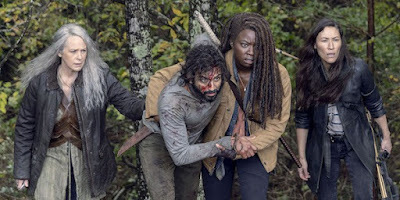 While The Walking Dead continues to shed viewers like a walker's skin in the hot sun, AMC still thinks more shows is better. We had heard a couple of months ago that a second spinoff of The Walking Dead was in the works, and now AMC has officially made it a go, only now we have some details. The untitled 10-episode series was co-created by The Walking Dead overseer Scott M. Gimple and writer Matt Negret. Negret will move from writing the flagship show into focusing solely on this new project, serving as its showrunner. Details are still slim but it will be set in a new corner of the Walking Dead universe and follow two young female protagonists who are part of the first generation to grow up in the undead age we've been following for years. Here is the current synopsis: "Some will become heroes. Some will become villains. In the end, all of them will be changed forever. Grown-up and cemented in their identities, both good and bad."